We sell “step-by-step” instruc­tions for $10 each. Order online today and we’ll mail you the instruc­tions tomor­row! You can also call us 310–792-4968 or email us to order your how-to pack­et. All “How-to” book­lets include a com­plete sup­ply list with instruc­tions on how to use the flo­ral sup­ply, how to make eyes, ears, noses, mouths, whiskers, and bows. 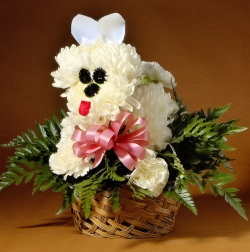 Pat­terns are also includ­ed for ears for flower pup­pies and flower bun­nies. All “how-to” book­lets include step-by-step instruc­tions with pho­tos illus­trat­ing each step. Learn to make your own Ted­dy Bear out of flow­ers. Includes a list of all sup­plies need­ed. 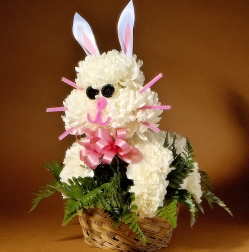 Includes instruc­tions on how to make a florist bow. 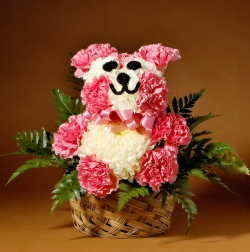 Learn to make your own Pup­py Flower arrange­ment. Includes two dif­fer­ent ear pat­terns — one for upright ears as shown. One for flop­py ears to make a poo­dle. 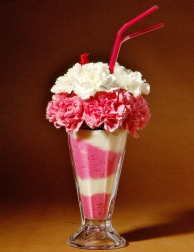 Make an ice cream soda out of flow­ers. We saw this for sale from a florist for over $50! You can learn how to make it for only $10. Learn to make bun­ny rab­bits out of flow­ers. 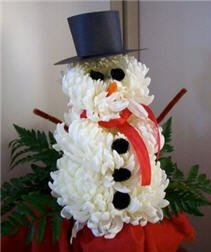 Learn to make a Snow­man out of flow­ers. Includes the list of all sup­plies need­ed and a hat pat­tern. Includes instruc­tions on how to make eyes, nose, but­tons and arms.